The 2018 Ford Aspire facelift has been launched in India at a starting price of INR 5.55 lakhs with the top-end diesel variant retailing at INR 8.14 lakhs. The petrol 1.5-litre automatic will cost INR 8.49 lakhs to own. 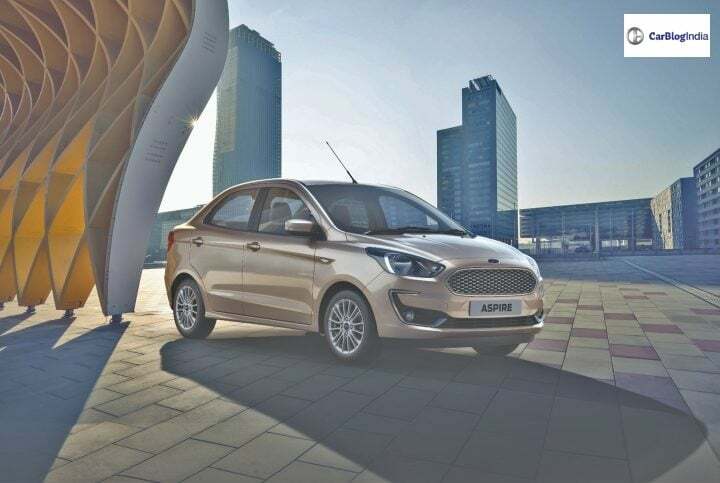 Ford India has today launched the mid-cycle update for the Aspire compact sedan. The Maruti Dzire competitor now comes with design updates and feature upgrades making it a more potent offering in its segment. Not only this but now it also comes with an all-new 1.2-litre petrol engine from the automaker’s Dragon series. It retains the 1.5-litre diesel engine and the 1.5-litre petrol engine which comes as standard with a 6-speed automatic gearbox. Prices for the new Aspire stand at INR 5.55 lakhs for the base petrol. While the top-end diesel goes for INR 8.14 lakhs. The 1.5-litre petrol automatic can be yours for INR 8.49 lakhs (ex-showroom). As mentioned before, the base variant of the Ford Aspire retail at a price of INR 5.55 lakhs. While the top-end petrol variant of the Aspire is going to cost INR 7.24 lakhs. The 1.5-litre petrol motor with the automatic gearbox is going to retail at INR 8.49 lakhs. The base diesel engine for the Aspire is going to cost INR 6.45 lakhs to own. On the other hand, the top-spec diesel variant is going to retail at INR 8.14 lakhs. These prices are ex-showroom. The biggest highlight of this mid-cycle update for the Ford Aspire is going to be the introduction of an all-new petrol engine. This gasoline driven unit is the same motor which made its debut in India with the Freestyle crossover. The new 1.2-litre, 3-cylinder Dragon series engine belts out 94 BHP of power along with 120 Nm of peak torque. It is going to come as standard with a 5-speed manual gearbox. The Ford Aspire 2018 facelift will continue with the same 1.5-litre petrol and the 1.5-litre diesel engine as before. The former is good for 110BHP along with 146Nm of peak torque. The latter on the other hand pumps out 99 BHP along with 215 Nm of peak torque. The 1.5-litre petrol engine comes with a 6-speed DCT automatic transmission. While the oil-burner gets a 5-speed manual unit as standard. Like we just told you, the 1.5-litre Petrol and Diesel engines remain unchanged in terms of specifications. Therefore, even the mileage they will deliver remains the same. The new 1.2-litre, three-cylinder engine, on the other hand, is sure to offer a higher mileage than the current 1.2-litre motor. We expect a peak mileage of 21 KMPL from this engine. In comparison, the Figo’s current 1.2-litre engine outputs approximately 19 KMPL. It may be noted that thanks to a lacklustre low-end, the engine fails to deliver a very high mileage in the real-world driving conditions. There are good chances that all this will change with the introduction of the new 1.2-litre, 3-cylinder Dragon series engine. The 2018 model of the Figo will have the same basic design. Hence, there won’t be any change in the dimensions. The Aspire facelift will offer a host of new features. We are expecting the addition of Ford’s excellent SYNC 3 infotainment system that offers voice control, USB, AUX-in, Bluetooth connectivity, and telephony feature along with an 8-inch touchscreen interface. Other than this, the infotainment unit also offers Apple CarPlay and Android Auto smartphone connectivity. Akin to the current model, the upcoming facelift, upon its market launch, will go on to rival the likes of Maruti Dzire, Hyundai Xcent, Honda Amaze and Volkswagen Ameo. Ford has always been at the forefront when it comes to providing safety equipment in its cars. The updated version of the Aspire will continue to come with features such as dual front airbags, side and curtain airbags, ABS with EBD along with ISOFIX child seat mounts. The compact sedan is also going to offer reverse parking sensors along with side and curtain airbags. The Ford Figo Aspire 2018 is likely to come with some major styling updates, especially at its front-end. As we can make out from the heavy camouflage, the car will have an updated grille and a pair of new headlamps that will likely have a projector setup and DRLs. The car will also have a new set of bumpers. The side profile will remain largely the same but we are sure the facelift will offer a set of stylish new alloy wheels. The Aspire 2018 facelift will come with many new features. Firstly, the cabin will have an all-black colour theme and the seats will get an upholstery change. Additional features will include the SYNC 3 infotainment system that will offer Apple CarPlay and Android Auto, Rear AC vents, auto headlamps, and rain sensing wipers.